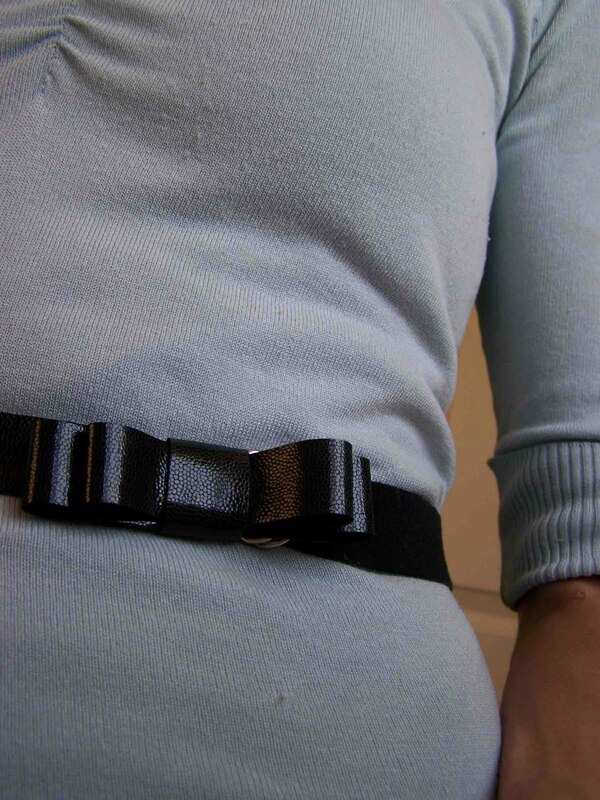 Okay, here is another simple faux leather belt using minimal materials. The only hardware that I used were some simple D shaped rings. It cost about a dollar and a half for a set of 6 D rings. You can find them in the notions department of craft or sewing stores. To make your belt you will want to cut a strip of faux leather the desired width of your belt. I would suggest cutting it 1/8"-1/4" thinner than the size of your D rings. Wrap the piece of material around your waist and cut the fabric so that they are about 6-8" of material overlap. The extra material serves not only as your belts tail, but also accounts for the material needed to attach the rings. 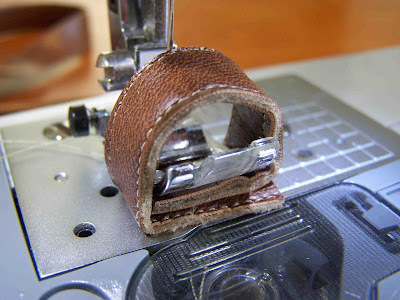 You can clip one of your belt tails at an angle, a point, or simply round the edge if desired. Now I made two belts using this technique. One out of the brown faux leather, and one out of black. The wrong side of the brown material was a much lighter shade of brown, and I didn't want to have it exposed when the belt was fastened. To avoid this, I cut a second strip of material that was about 1" wider than the width of my belt. With wrong sides together I stitched around the perimeter of the belt so that my belt was the same on either side. I'd stitch no further in than 1/8" of an inch. Now when doing so I had my belt centered on the second piece of material, there was about a half inch overlap on either side. This makes the stitching much easier. You don't have to worry about keeping your pieces perfectly lined up. I simply trimmed the bottom layer of fabric when my perimeter stitching was complete. My black material was black on the wrong side of the fabric so I chose to omit this step. Now it is time to attach your rings. You will slide two rings the blunt end of your belt. Fold the material over so that there is at least 1" of overlap. You will now stitch the material together to secure the rings. I made two rows of stitching on the black belt. The first row of stitching was about 1/2" away from the end of the belt, and the second row about 1/4" further out than that. Clip any extra overlap material. With the brown belt version I stitched a box shape with an X through the center. I wish that I wouldn't have made the box quite so large, a one inch box would have been sufficient. The larger box became problematic when trying to camouflage the rings and the stitching (which explains why you don't see any finished photos). 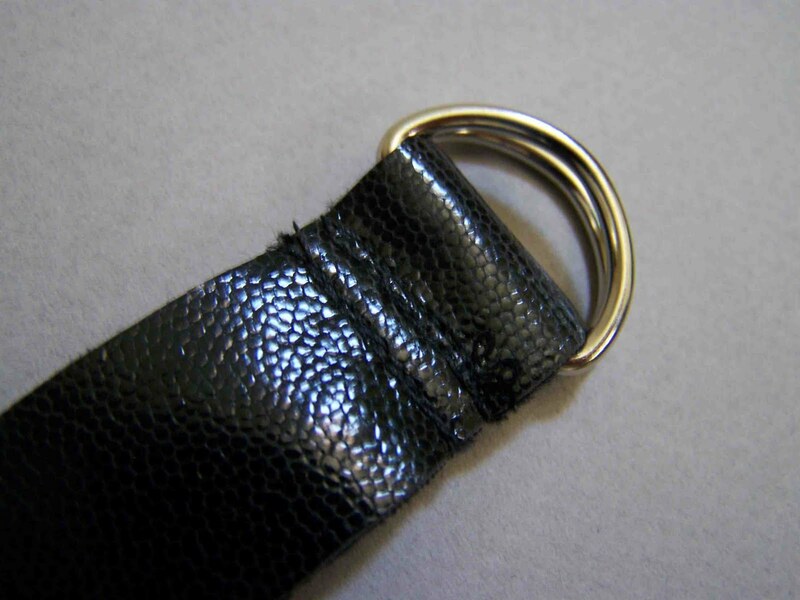 Once you have attached your rings your belt is nearly complete. You may want to add a simple loop for the tail of your belt. To do so I simply cut a piece of material that was about 2/3 the width of my belt. I overlapped the ends, either hot glued (the black belt) or stitched the ends (the brown belt) together. 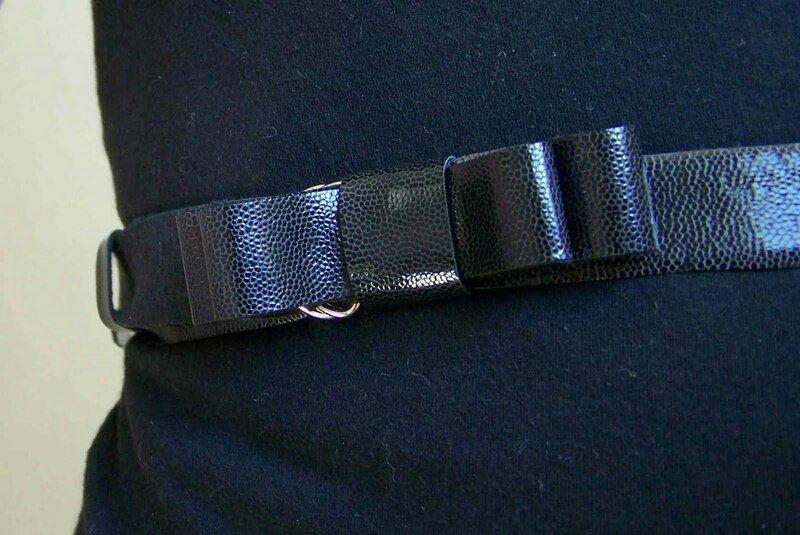 If you choose you can attach the loop itself to your belt, I chose to leave my free floating for size adjustment. You could wear the belt as is, or you could add a few additional pieces to cover the rings and stitching on your belt. With this black belt I decided to apply Disney's Lauren Headband bow to the belt. I like that it is wide enough to cover the rings, but simple enough to not add bulk to the belt. You could use any number of things to dress up your belt. A felt flower, a large button, a brooch, ect. For detailed instructions visit Disney's blog for the actual bow making tutorial. 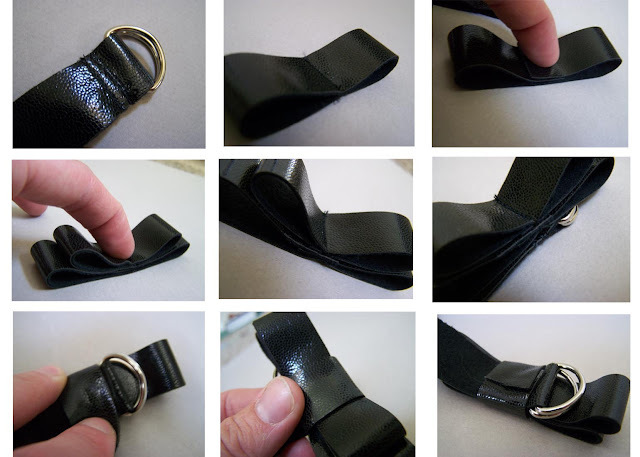 Here are a few images and simple instructions for applying the bow to your belt. 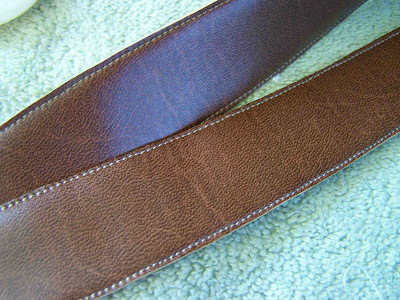 Cut a piece of faux leather the width of your belt that is 15-16" long. Cut an additional piece of material for the center of the bow that is about 4" long. I few small changes to her bow. One variation being that I sewed the loops together rather than hot glueing them. I am sure that you could make a hot glut gun work, but it is awfully hard to stitch through hot glue. I also made two separate loops that were secured by stitching. Rather than looping the bow on each side I made a top loop with a small overlap, cut and stitched it. I made a slightly larger bottom loop, cut and stitched that. 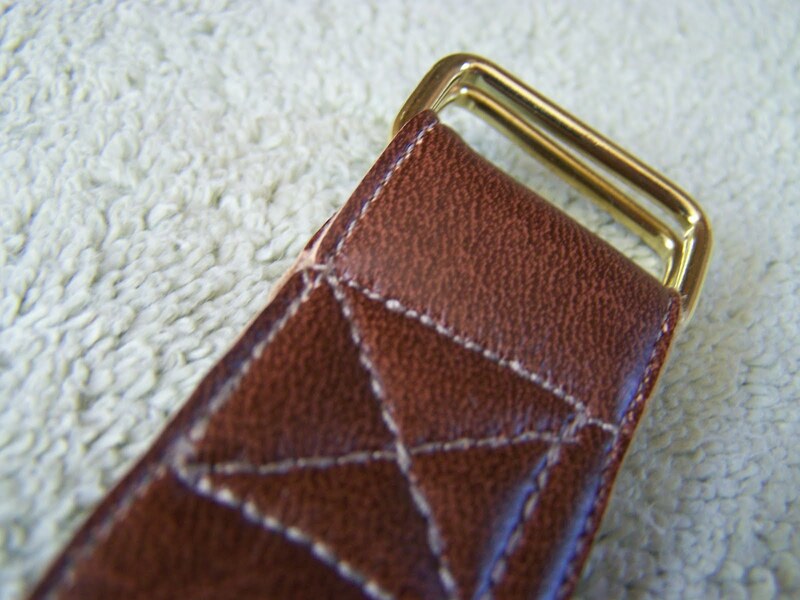 I stacked them on top of one another, and centered them over the stitching on my belt (the ring attaching stitching). Next I stitched down the center of the bow and through the belt, making sure to backstitch at the beginning and end of the stitch. Once my bow was securely stitched to my belt I took a scrap piece of material and wrapped it around the center of the bow, and hot glued the overlap. That is it. 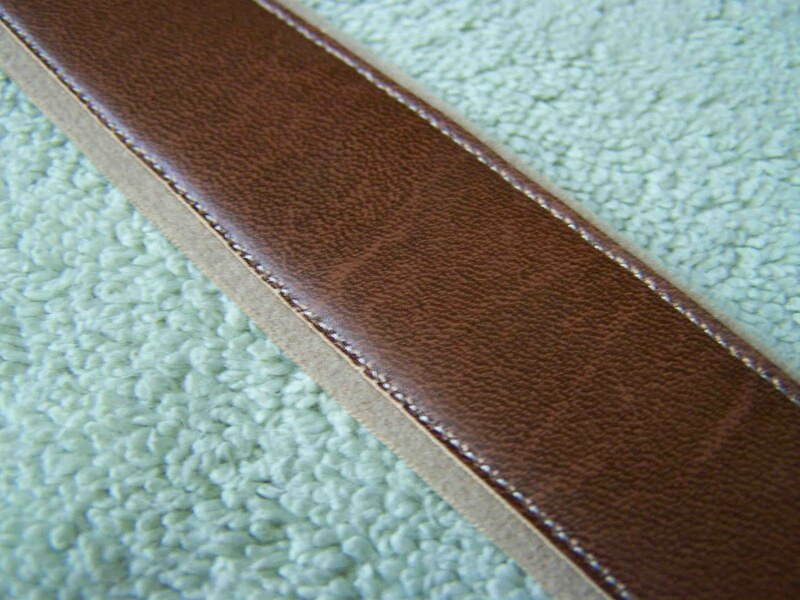 A simple faux leather belt just for you. Click here to see which great linky parties I'm participating in today. oooh, that belt is fabulousness!!! I am LOVIN' that bow!! Oh wow, that's gorgeous! How perfect for fall! I jsut clicked over from Craft Gossip and I'm so glad I did. I would love to link to this if you didn't mind. Hello, dear blog readers! If you need a leather belt I strongly recommend to buy it from UnitedSplit. Their leather belts are manufactured at the same factory for over than 25 years, and been marketed to hundreds and thousands of shops and businesses, both as a fashionable, modern and long lasting product. Thanks!